After 10 years of tenacious lobbying, the ratification (official endorsement) of three ILO Conventions on health and safety at work permanently. It is the ILO Conventions 139 on occupational cancer, 148 for work environment and about 170 chemicals. With the signing of these treaties are some basic standards for the protection of employees in the Netherlands anchored. It is about protection against occupational cancers, the harmful effects of air pollution, noise and vibration and use of chemicals. Netherlands meets the requirements of the conventions and the ratification will help in order to maintain it in the future. 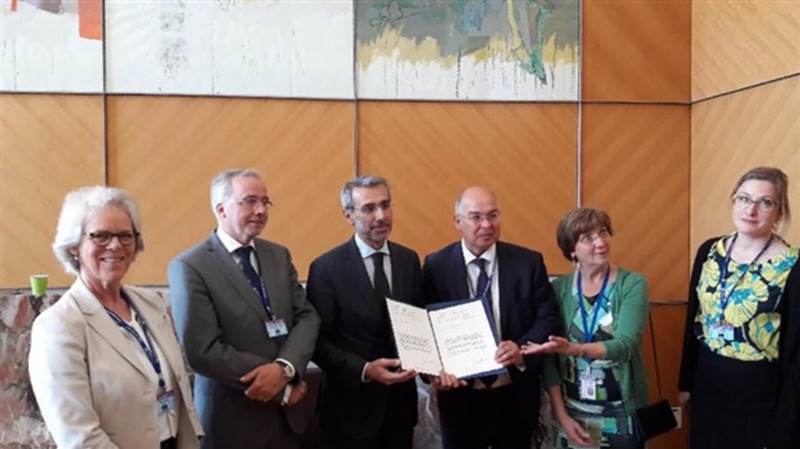 The official presentation of the ratification papers took place on Thursday, June 8th at the ILO conference. The ILO legal adviser, who received the papers very special mentioned that the papers were presented by a tripartite delegation. Usually the government does alone. Now were unions FNV and CNV and employers' organization VNO-NCW present at the signing. The ILO negotiating governments, trade unions and employers' organizations from around the world on international conventions that protect the rights of workers. These agreements are valid if they are signed by countries and incorporated into national legislation (ratify). The more countries sign a treaty, the more important the Convention is for a fair globalization. According to an estimate by the ILO 2.3 million people die worldwide each year from accidents at work or occupational diseases. That's 6,300 per day. International conventions on health and safety at work contribute to reducing this number.